Time Is My Enemy is a 1954 British crime film directed by Don Chaffey and starring Dennis Price and Renée Asherson. Small-time crook Radley (Dennis Price) returns after a long absence to discover his wife Barbara (Renee Asherson) has remarried, believing him killed in the Blitz. Finding her happily married to wealthy publisher John Everton (Patrick Barr), Radley begins blackmailing Barbara for £500 to keep their previous marriage quiet. When Radley kills a jeweller in a robbery, he is blackmailed by his roommate, so in turn threatens to also blackmail John Everton for £500. When she arrives at Radley's flat to pay the final instalment, he provokes her into shooting him. After surrendering herself to the police, Barbara discovers that all is not as it seems, Radley is wanted for more than one murder; and the police begin to question whether Radley is really dead after all. ^ Goble, Alan (1 January 1999). "The Complete Index to Literary Sources in Film". Walter de Gruyter – via Google Books. 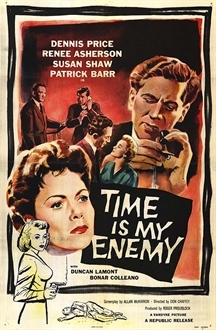 ^ "Time Is My Enemy (1957) - Don Chaffey - Synopsis, Characteristics, Moods, Themes and Related - AllMovie". ^ "Time Is My Enemy (1954)". This page was last edited on 8 February 2019, at 12:20 (UTC).